This week, we’re tackling the top five questions we hear about one of ReadCube’s most important features: Import. Can I speed up the initial import of my existing collection? Some people have very, very large ReadCube libraries, sometimes totaling more than 10,000 articles. Regardless of what kind of computer you’re using, trying to index 10,000 articles is likely going to slow your computer down a bit and will definitely take some time. Fortunately, there are a few different ways you can speed this process up. The best way to speed up the indexing process up is to split the import into a smaller segments. If you need to import 5,000 articles, try importing chunks of 1,000 articles instead of importing them all at once. The importing process occurs over two phases: first, your physical PDFs are appropriately linked within your library such that opening an entree in your library will open the correct article, and then all of those articles are indexed using PubMed/Microsoft Academic/Our stored data. By importing smaller chunks of articles, you reduce the chance of ReadCube getting hung up on the first step and also reduce the amount of time the second phase takes. 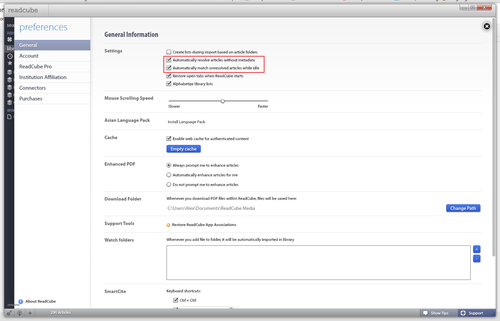 If the indexing process is just taking too long and you’d rather do it manually or leave for later, you can turn off automatic indexing under the preferences menu. This allows you to import all of your articles, then manually select them in your library to index one at a time. If you leave your computer alone with the “Automatically match unresolved articles while idle” function enabled, your ReadCube will automatically match unindexed articles for you.